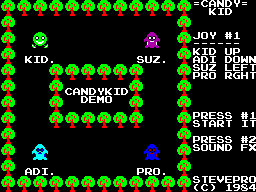 Candy Kid Demo - Homebrew - SMS Power! 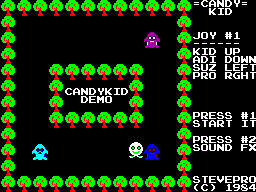 Candy Kid Demo is based on the retro arcade simple maze chase video game Candy Kid. The goal was simply to port a basic demo to run on real Sega Master System hardware. INSTRUCTIONS Move joystick Up / Down / Left / Right to alternate Kid / Adi / Suz / Pro sprites. Press button 1 to start demo and press button 2 to play random sound effects. Note: press Pause button the real hardware should pause / resume the demo. 0x0050 Steps to move Kid: 1, 2, 4, 8 pixels. 0x0051 Delay for enemy ghosts arm moves. 0x0052 Hands for enemy ghosts to toggle. 0x0053 Music 0=music play otherwise off. 0x0054 Sound 0=sound on otherwise off. 0x0055 Paths to test individually 1 thru 8. CREDITS Extra special thanks to: sverx for devkitSMS https://github.com/sverx/devkitSMS Special thanks to: Maxim, Martin, Ville Helin, Steve Snake, Bock + Emulicious devs Also, I "borrowed" sound effects from Baluba Balok http://bit.ly/2nnSQJG Thanks!